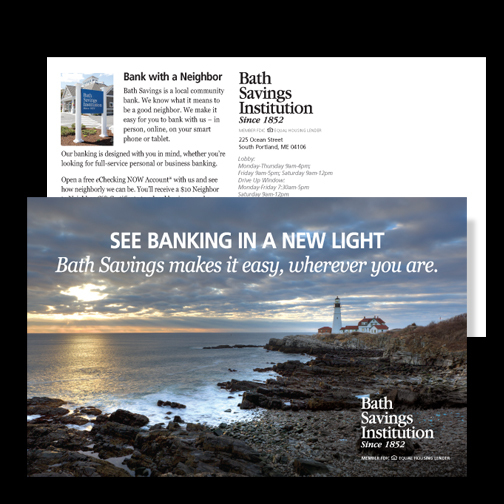 Bath Savings Institution is a true community bank, proud to be local since 1852 . BSI loves celebrating its roots with imagery of the coastal Maine communities it serves. The current brand image is a stunning photographic portrait of Portland Head Light in Cape Elizabeth. The sweeping vista highlights the connection with BSI’s newest location in South Portland, which also serves clients in Cape Elizabeth. Bath Savings loved the image so much that it’s now featuring it across communications, from web to direct mail.